For Season 5’s first Last Chance Design Lab challenge sponsored by CND, Jerilee Fair and Melisa Salazar will battle it out one-on-one to see who has a chance of staying in the competition. CND’s Jan Arnold will select her favorite look Friday and you’ll find out who will remain for at least one more week. Since Melisa packed her paintbrushes after Mia Secret’s Safari Mani challenge, this week’s Last Chance challenge is loosely related. 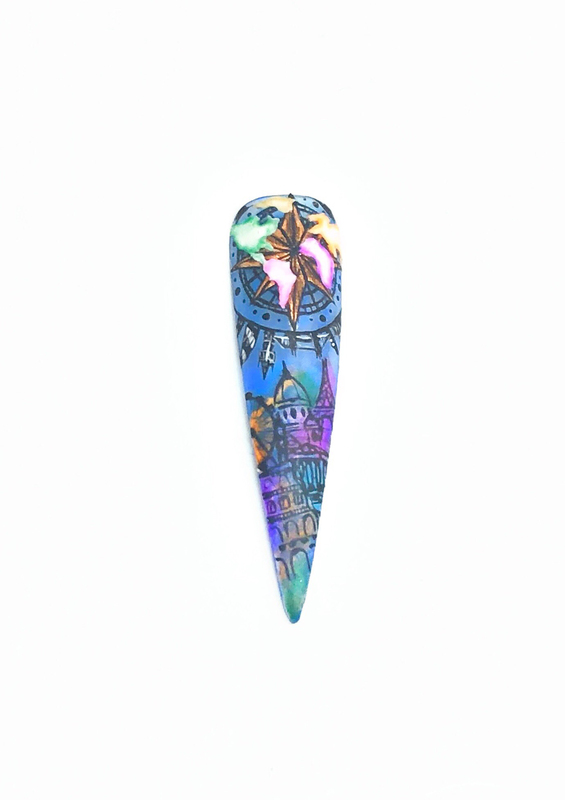 Dream Vacation: Hand paint a single nail tip illustrating your dream vacation. Ever since my first art class in high school I’ve been obsessed with Italy — the food, the wine, the history! In my early ’20s, I decided I was going to take the plunge and starting taking Italian language classes at a night school. Then life had its own plan and three children later I’m still here, waiting for my dream vacation. For this nail I decided to show the famous holding up/pushing over pose for the Leaning Tower of Pisa. A must-do for your funny yet memorable vacation snaps. Using gel-polish to create this design, it’s best to start with flat base colors and then build shadow and light as you go. Remember to cure along the way as this will really bring your design to life. Once you are happy with your shading you can top coat and add any outlines to finish, to really make the nail pop — this is a great trick because you can easily remove any mistakes without upsetting the work you’ve already done. A final top coat can now be applied. I used a mix of both matte and gloss top coat to showcase the background and foreground in the design. My vacation would be to travel around the world with my husband. Everyone has different ideas for a vacation. There’s no single destination I want to visit more than another place. For me, every place is a unique experience. When you look at my dream vacation nail tip, I want you to be inspired! As an artist, I’m always thinking creatively. As a person, I’m always interested in understanding and seeing new things. Lots of people travel the world to find themselves or gain some higher truth about their being. That’s great, but I’m just looking forward to discovering inspiring stories, histories, cultures, and art. The tip of my nail reminds me where I’ve been and shows where I still need to go. There is an entire world full of amazing people and destinations waiting for me! More importantly, my nail tip proves that if I can do this, I can do anything. I would like to leave my experience with NTNA knowing that anything is possible. I have learned so much from the challenges and contestants. Like in all my travels, there is so much value in talking to strangers. Everyone has a story. Traveling is a great way to meet like-minded individuals. All of our talented NTNA contestants are also traveling to their own big destination. I hope you enjoy the experience like I did. 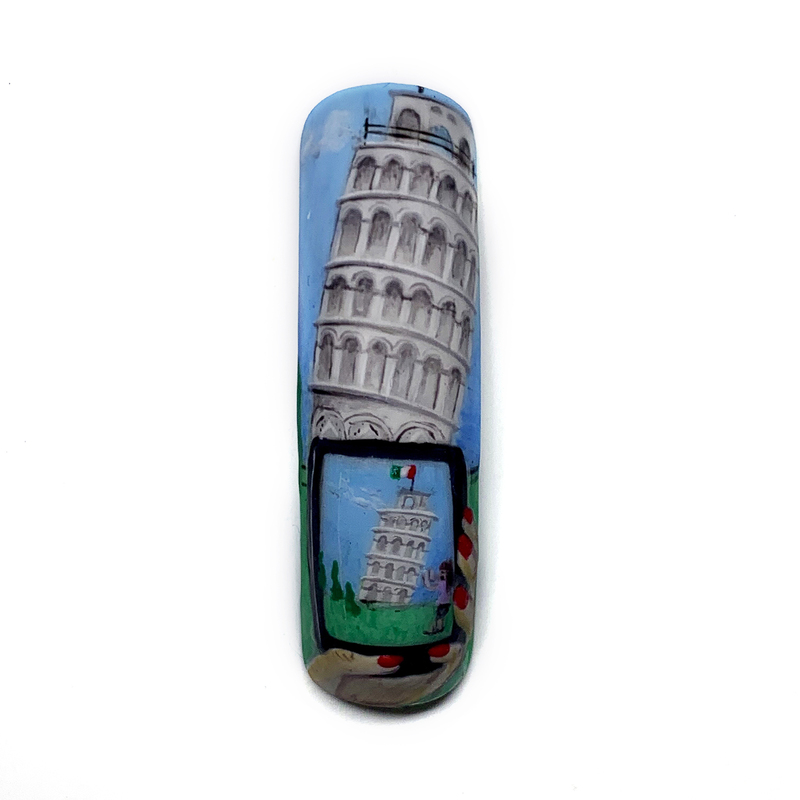 I painted my nail in a collage style with emblematic buildings from different countries and gave it a watercolor finish using LeChat’s Perception gel-polish. Congratulations to Melisa Salazar for winning the first Last Chance Design Lab challenge of Season 6! Melisa went up against Jerilee Fair to show us her dream vacation on a single nail tip. CND’s Jan Arnold chose the winner. This means Melisa will move on to compete against the next eliminated contestant. Find out tomorrow who that will be.